The Funniest Half Hour You’ll Have all Week. TODay. The show that brings you the best videos from around the web. We find them so you don't have to! Watch some of the best clips here. These epic fails are worth the wait. Don't miss more funny clips, hilarious pranks, and must-see moments! Less of a flip, more of a FLOP. Check out these hilarious stunts that go horribly wrong. Watch these tough guys turn into scaredy-cats! Bugs, mice, even loud noises... you will not believe these men's reactions! These soccer fouls are epic FAILS! From missed shots to ball blunders, these clips are comedy #GOALS. Catfight! You don't want to get on the bad side of these kitties - after all, they do have 9 lives. It takes a village... to raise some hell. When these families get together, it all falls apart. Not all of these playground stunts are a walk in the park... you do not want to miss these painfully funny moments! Party FAIL! Watch as these celebrations go very, very wrong. Fun in the sun becomes a sunburn. These hilarious clips will keep you laughing all day long, even if you're stuck inside. Time to call your insurance! From parking predicaments to driving monkeys, you have to watch to believe some of these crazy moments! With friends like this, who needs enemies?! These clips will have you laughing out loud! What goes around comes around... in these hilarious clips that show you what karma is all about. Are you ready for this? These scares, shocks and pranks will have you jumping out of your seat and rolling on the floor laughing. It's time to prove your innocence. In these clips, you'll see people (and pets) go to all kinds of extremes to prove they didn't do the deed. Better pack that bug spray - we're headed outdoors for some hilarious pranks, funny clips, and must-see moments. Ouch! These moves didn't go quite as planned, but they will have you laughing out loud. Ready for a spa day? From makeup tutorials to hair trims, these adorable clips will help get you in the mood. Summer is here, and what better way to celebrate than by watching these hilarious water wipeouts?! When it comes to relationships, communication is key. Don't miss these must-see clips - they're guaranteed to be the funniest part of your day! What's mine is mine and what's yours is... mine? 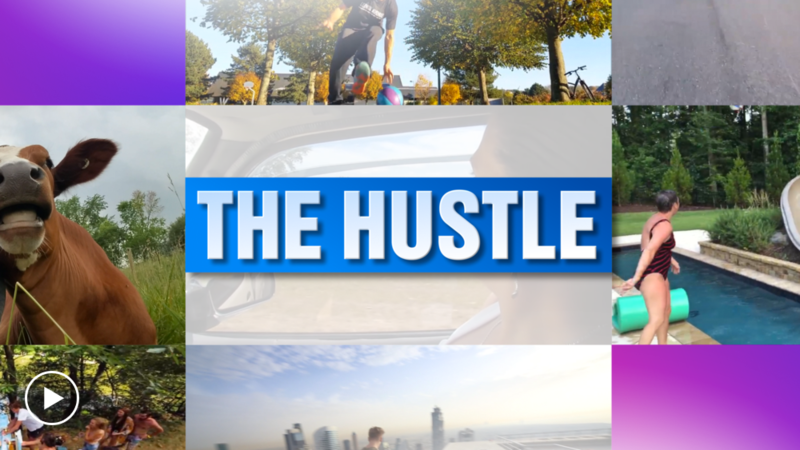 Watch these hilarious clips, and don't forget to tune in to "The Hustle." It's time to feel the burn. These clips will have you stretching, squatting and rolling your way to a laugh-out-loud day!